When I spotted this chicken on Pinterest I knew that I had to make it. But I needed a reason to make a pound of bacon and turn the grill on. Enter Sunday afternoon when our friend Chris came to watch some NFL game with Alex. Turns out the recipe is not as bad for you as it looks. 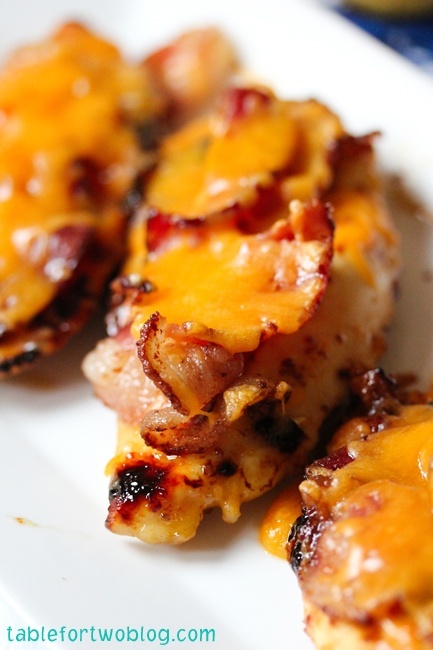 It is basically just chicken marinated in a mustard and honey mixture, grilled and topped with bacon and cheese. OK it is not a Weight Watchers recipe, but could be worse. Turns out the original recipe IS worse. It is from the Pioneer Woman and calls for the chicken to not be grilled but cooked in the bacon grease. See? Totally worse. And it is a recipe that the whole family could eat. For the boys they got the chicken and with bacon on the side (even James with his 8 teeth, all in the front, figures out how to eat bacon). I served it with some quick oven roasted broccoli and we all enjoyed it. 1. To begin, make the marinade. In a zip top bag, mix together ½ cup Dijon or country/grainy mustard with ½ cup honey, juice of ½ lemon, ½ teaspoon paprika, and ½ teaspoon salt and whisk until smooth. Set aside. 2. Next, rinse the chicken breasts, place between two sheets of waxed paper and pound to around ½ to ¾ inch thick with a mallet. 3. Next, add the chicken to the bag with the marinade and place in the refrigerator for 1 to 3 hours. 4. While the chicken marinates, fry up some bacon. 5. Heat the grill to med-high heat. 6. Take chicken out of marinade and discard excess. Cook 3 min on first side. Flip and top with bacon and cheese for the remaining 3 minutes of cook time.